Fresh mozzarella cheese is one of the best foods ever. If you have had the opportunity to get it so fresh that it was still warm then you know exactly what we are talking about. It has this soft milky texture that you don't get from those store bought blocks of mozzarella cheese. For a long time now we have wanted to make our own, but really did not know where to get the equipment and ingredients. 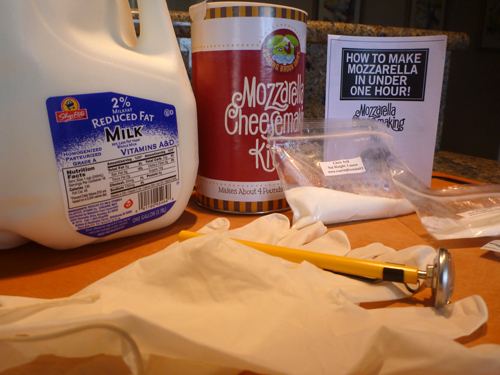 That was until we found a Mozzarella Cheese making Kit online. The Rolling Brook Dairy sells a mozzarella kit online through Amazon.com for about $20. The kit comes with everything you need to make cheese except for milk. Here is our first attempt making fresh mozzarella cheese. 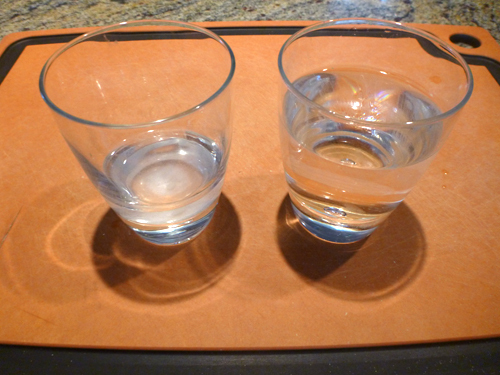 Prepare the rennet-water solution by dissolving 1/4 tablet of rennet in 1/4 cup of cold water. Measure 1 1/2 teaspoons of citric acid into 1 cup of cold water, stir to dissolve. When the milk reaches 100 degrees, stir the rennet-water solution and add it to the milk. Stir the milk in an up and down motion for 30 seconds. Heat the milk to 105 degrees, and then turn the heat off. Cover the pot and let sit for 10 minutes. You should see signs of coagulation. 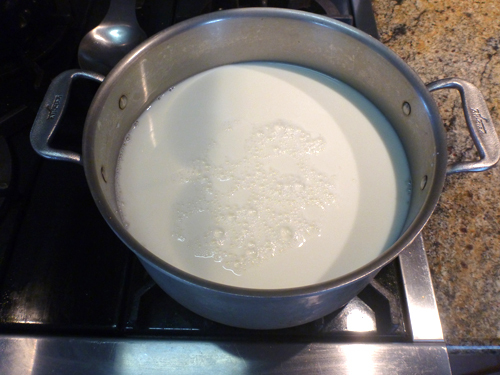 The curds (the white mass) should look like shiny yogurt and begin to pull away from the side of the pot. The Whet (liquid) should have a yellow tint. To check if the curds are ready gently press the back of a spoon into the curds. If it leaves a dent, the curds are ready. If it does not, allow the curds to sit for another 2 minutes. Using a strainer or a slotted spoon, gently lift up the curds and let the whey drip back into the pot. Then place into a colander. When all the curds are in the colander, gently press the curds with the palm of your hand to push out as much whey as possible. When there is almost no whey coming out of the curds, place the curds in a microwaveable bowl. Again, using the palms of your hands, press down gently on the curds and remove as much whey as possible. Put on glove if desired to protect hands from the heat. Remove the bowl of curds from the microwave. Drain the whey and then gently fold the curds over to distribute the heat. Continue to drain the whey. Microwave the curds for an additional 30 seconds. Drain and knead the curds again. Knead the curds until it begins to look smooth, shiny and is firming up. Try to stretch the cheese now. It must be 135 degrees to stretch properly. If it is not hot enough, microwave for another 30 seconds. Add the salt and any other herbs and begin to work into the cheese by stretching and folding, and repeat this movement. If you prefer a softer texture, do not stretch cheese as much. As soon as it is smooth and shiny (like taffy) shape it into a ball. Form a ball by pulling and tucking the edges underneath the cheese. 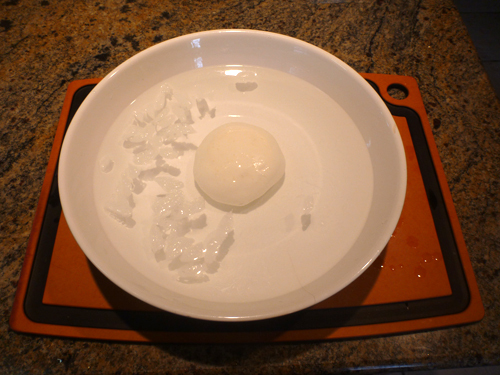 To keep the ball shape, place the mozzarella in an ice water bath for about 15 minutes. Well we did get homemade mozzarella cheese, unfortunately it did not turn out exactly as we had expected. Our cheese was too stiff and dry, it had the consistency of a block of Polly-o Cheese. It also was bland, we should have added more salt. From our experience, cheese making is an art that takes practice. Many of the problems with our cheese are most likely our fault. We think it was a bit too stiff because we over handled the curds and extracted too much whey. We also were surprised with the small amount of cheese that came from 1 gallon of milk. It produced a ball of cheese about the size of a softball. The kit however provides you with enough ingredients to make about 4 balls of cheese as long as you buy the milk. We used 2% milk the first time, we plan use whole milk the next time around.